Written by health professionals: M.D., Psychologist and others, yet easy to read. Ringworm - Tinea capitis and tinea capitis treatment, and how it is different to baby cradle cap Dandruff and Dandruff treatment, or is it Baby Cradle Cap? CONTENTS: What are the baby cradle cap symptoms? ~~ Where do cradle cap symptoms appear? ~~ Is cradle cap dangerous? ~~ What causes cradle cap? ~~ Is cradle cap contagious? ~~ How is baby cradle cap diagnosed? ~~ What is the common medical name for cradle cap? What are the baby cradle cap symptoms? It can cause scales and thick crusts in patches on the skin. Yellow and white scales can occur near each hair and appear to be associated with the hair shaft itself. Because of the skin inflammation, the scales may rest upon an area of red, greasy skin. 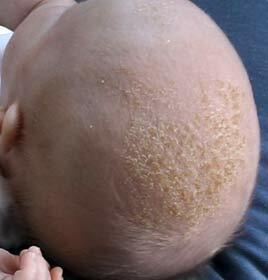 The cradle cap may appear to flake off like dandruff. When cradle cap occurs on the scalp it can lead to hair loss. Photo of cradle cap above can be found on wikipedia along with its licensing terms, same for the photo to the left. 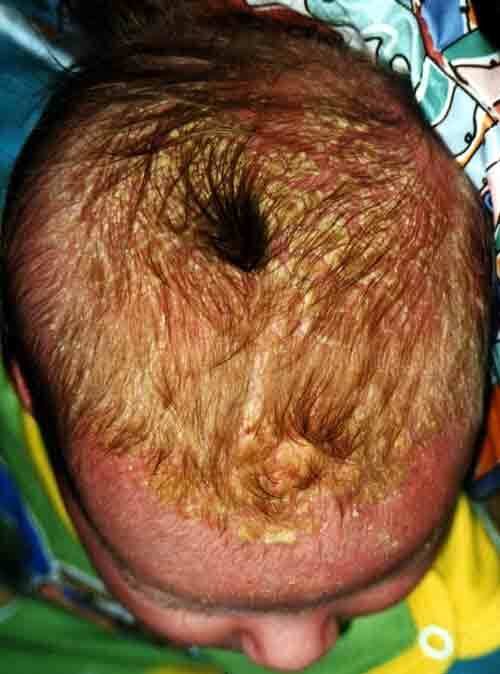 The above photo clearly shows the yellowy crust formation and the reddened inflamed skin, which are the typical appearance / symptoms of baby cradle cap. The photo to the left shows the typical honeycomb appearance / symtpom of baby cradle cap. Where do cradle cap symptoms appear? Cradle cap appears on the scalp, face, and neck but can show up on the back or in any area of oily skin. This common skin disorder is harmless but it can be itchy and irritating. Fortunately when cradle cap occurs in very young children it is not usually as itchy as it is in older kids and adults. The cause of cradle cap is a bit of a mystery to doctors and scientists. A fungus called Malassezia appears to have a role in the development of cradle cap however the amount of the fungus is no higher on children with cradle cap than it is on other kids. It seems that the way the immune system reacts to the microorganism is the difference between kids with cradle cap and kids without. In other words, Malassezia can occur on anyone’s scalp, but only certain kids will get cradle cap depending on how their immune system reacts. Is cradle cap contagious - can cradle cap be caught off someone, such as another baby? Because the development of cradle cap is dependent on the immune system rather than the presence of a fungus, cradle cap is not contagious nor is it caused by being unclean or from poor hygiene. It is not technically an allergic reaction, either. However, it does seem to occur more frequently within families, thus further supporting the notion that a person’s particular immune system is responsible—the immune system qualities are passed on genetically. How is baby cradle cap diagnosed? In most cases the diagnosis is based on what the skin lesion looks like. A pediatrician or dermatologist can usually make the diagnosis visually. If the cradle cap appears unusual, the doctor may take a scraping of the skin (painless) and have it analyzed in the laboratory to rule out a more serious fungal infection. What is the common medical name for cradle cap? Cradle cap is the endearing term given to a rather unsightly and uncomfortable skin condition. The medical term often given for cradle cap is seborrheic dermatitis, which can occur in people of all ages, though the term cradle cap is obviously reserved for young children. ABOUT THE AUTHOR: Michael T. Spako is an M.D. who chose to pursue a medical writing career instead of a doctors practice. I am pleased to have him as the principal writer for this cradle cap treatment site, and look forward to his further contributions. Donald Urquhart, Psychologist, Editor.